Five keys to wine: Acid, Tannin, Alcohol, Sugar and Body – How to detect them? Jairo Sanchez has selected this relevant article on Wine Tasting. Enjoy! How do they translate into your flavor experiences? It’s nothing too mysterious. “Structure” is most often used in reference to relative levels of acid (especially whites) and/or tannin (reds). But there are other things that come into play such as alcohol, sweetness and body. Isolated, none of these components are tasty or interesting. Think of them as the framework of the wine, just waiting to be fleshed out by delicious things like fruitiness, fermentation character, oak, floral character, herbaceousness, minerality, etc. Fortunately, Mother Nature has made it remarkably easy to detect the relative levels of the main wine components. Grab a glass of red wine and taste as we go and you’ll see what I mean. Alcohol is the only one of the main components that has an aroma, so you’ll have to rely on your palate to differentiate between the rest. Using the slurping technique will really help. For the uninitiated: Take a little sip of your wine. Taste good? Now, all you have to do is take another small sip and hold it in your mouth. Purse your lips and pull some air in through your teeth and over the top of the wine (kind of like whistling in reverse). Swish it all around your mouth, like mouthwash, and chew on it a little. Wow – flavor explosion in your head, right? Now, we’re ready to get started. Important: All of us have different sensitivities, so you might detect alcohol more readily than I do – I’m a cheap date. And, I might notice acid more easily than someone else. Let’s start with acid: Of course, acid has a tart flavor. Incidentally, if you refer to high-acid wine as sour you’re going to get a very sour look from the winemaker. In wine parlance, sour means spoiled, as in gone to vinegar! If you want to become acquainted with the tart flavor of relatively high-acid wine, some common white examples are sparkling wine, Sauvignon Blanc and Riesling. Northern Italy turns out a lot of lean, zippy reds. Some wines, especially reds, are so flavorful that it’s difficult to taste the acid. Usually, you can still gauge it. As you taste the wine, notice the way your mouth begins to water, especially along the sides of your tongue and under it. Thus, the birth of the phrase “mouth-watering acidity.” Now that you’ve noticed it, you’ll begin to differentiate the levels as you taste different styles of wine. Generally, white wines are higher in acid than reds. Well-made dessert wines can really turn on the water works in your mouth because the sweetness needs to be balanced by a high level of acidity. Why do you care? Acid is important because it keeps the wine fresh and lively on the palate. It has a cleansing effect and makes the wine easy to pair with food. Acid is a great, natural preservative! Wines that are high in acid (but balanced) will have fairly long lives and a better chance of retaining their fruitiness and freshness as time goes by. The source: The grapes, although acid additions are permitted in many wine regions. As the grapes ripen, the sugar increases and the acid decreases. At harvest time, timing is everything! Do you have a sudden urge to brush your teeth after tasting red wine? 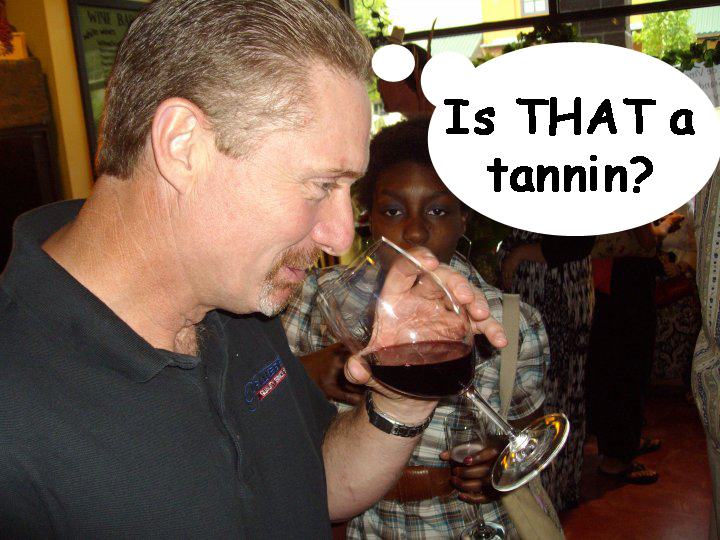 Then you recognize tannin – it’s that simple. It runs around your mouth seeking out protein and then clings to it, which explains the drying sense of grip on your gums – all over your mouth, really – and the furry teeth. The flavor of tannin is extremely bitter, so winemakers try to craft the wine in such a way that you feel it, rather than taste it. As you taste your wine now, you will probably remember other wines you’ve tasted that were more tannic or less tannic, so you’ll begin to recognize relative levels. Acid accentuates the hardness of tannin, so high-acid wine that’s also tannic can be hard to enjoy when it’s young. As the wine ages, the tannin enlarges with oxidation and gradually falls out of the wine as part of the sediment. So, the wine gradually softens and the texture becomes more velvety over time. Why do you care? Tannin is an important part of the texture of red wine – when managed properly it gives it a nice chewiness. Like acid, tannin is a natural preservative. It’s part of a group called polyphenols, which are anti-oxidants that prolong the wine’s life. The more tannic the wine, provided it’s well made and well-balanced, the longer its life in the bottle when stored properly. The source: The biggest source of tannin in wine is the grape skins. Other sources are the seeds, stems and oak (wine barrels contribute wood tannin if they’re relatively new). Red wines are almost always higher in tannin than white because the winemaker must ferment the juice and skins together to get the purple color. Whites receive little or no juice to skin contact. Isolated, alcohol smells sweet. Give the wine a good swirl for a few seconds and pop your nose in the glass. If you actually smell something sweet that reminds you of rubbing alcohol or feel what seems like a heat-driven tickle in your nose, the alcohol is too high for the style of the wine – it’s not balanced. You’re not supposed to notice the alcohol, it’s just supposed to be there. The mouth-feel: Do you notice that your mouth feels warmer than it did before you sipped the wine? That’s the alcohol talking and in a very pleasant way. If it’s quite warm, or almost hot, the alcohol content is on the high side. If you actually taste the alcohol or feel like a fire-breathing dragon, it’s too high, not balanced. It seems to be most noticeable in the back of your throat. The alcohol also adds an oily, viscous sensation. Why do you care? Alcohol gives the wine a great deal of its body or “heft.” A wine that’s meant to be robust in style feels thin and unsatisfying on the palate if the alcohol is too low. Alcohol is yet another preservative, which explains why Port-style wine can live so long in the bottle and actually keeps better than table wine once it’s opened (sugar also helps in that regard). The source: The sugar in the grapes at harvest. In many parts of the world adding sugar is permitted. It’s called Chaptalization. During the fermentation the sugar is converted to alcohol. Well, this one’s easy – we all know sweetness, right? And that “dry” is the opposite of sweet? Sweetness also has a pleasant, slippery sort of mouth-feel. Since sugar is so familiar, this is a good time to talk about perception vs. reality. The level of acidity can really play games with your head in gauging sweetness. It makes the wine seem less sweet than it is. Sparkling wines called “brut,” for instance, are considered dry, but they may actually have as much as 1.5 percent sugar (our threshold for noticing sweetness in wine is most often at about .5 percent). They taste dry because they are so high in acid. Try making some overly-tart lemonade and give it a taste. Then add a little sugar. Keep tasting and adding sugar until you reach a pleasant balance. Notice how the sugar has softened and rounded out the acid sensation? The acid level hasn’t changed, but your perception of it has. Fruity flavors can also trick your palate into detecting sugar that isn’t actually there. The phenomenon is called auto-association. 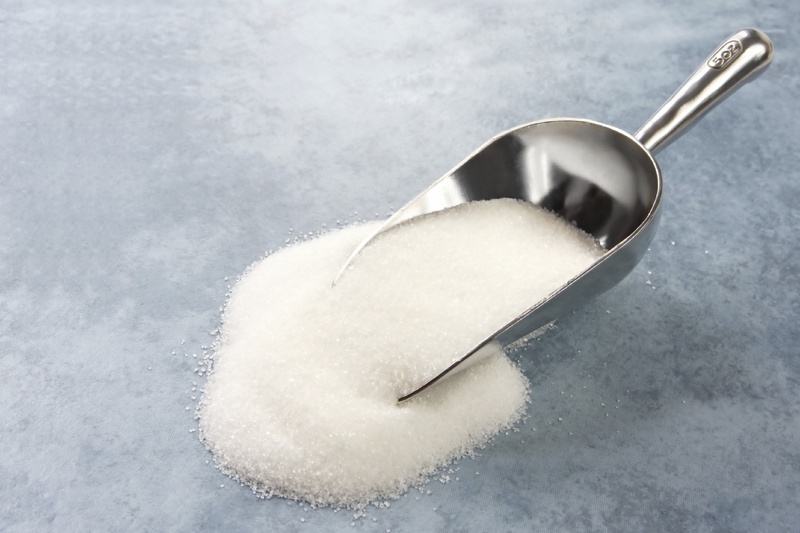 If dry is .5 percent or less, off-dry can be up to about 4 percent sugar, medium sweet up to 10 percent sugar and anything over that is very sweet, indeed. But our perception? That’s another matter. Why do you care? Who doesn’t love something a little sweet from time to time? Plus, besides its rounding effect on overly tart wine, a bit of sugar can cover a lot of sins in the production of inexpensive wine, and it’s another of Mother Nature’s natural preservatives. The source: The grapes. In most cases the sugar in wine is residual, unfermented sugar because the fermentation was stopped before the yeast converted all of the sugar to alcohol. In some cases, the winemaker ferments to dryness and adds back grape juice or grape-juice concentrate to sweeten the wine. When the wine is balanced, the flavors, body and the relative level of the components interact harmoniously. Since alcohol gives wine body, a glass of red Bordeaux from a poor vintage that’s only 10.5 percent alcohol may feel thin and unsatisfying on the palate. Conversely, a Napa Cab from a hot vintage better have plenty of flavor and body to stand up to 15 percent alcohol. Otherwise, you will have spent a lot of money on something that makes you feel like a fire-breathing dragon. The source: Mainly the alcohol and grape extracts (red); barrel-aging can increase the body due to evaporation. For more wine tasting information from Nancy, check out her blog: thetastinggroup.com. This entry was posted in Magazines and Books wine related, Wine - Vino - Vinho and tagged Acid, alcohol, Body, Sugar, Tannin. Bookmark the permalink.